APPLICABLE MODELS: Fast charge modes（1.4 times faster than standard wireless charger stand）are ONLY available for Galaxy Devices – S8, S8 Plus, S7, S7 Edge, Note 5, and S6 Edge Plus models. Other Qi-enabled devices will charge at regular speed. INTELLIGENT LED INDICATOR: Intelligent LED indicator on the wireless charger shows the state of safety charging. The wireless charging stand will turn into blue for 2 seconds when it connects to the power, and will turn into green and stay when it starts to charge the phone. TIPS: Highly suggested purchasing one QC 2.0 or above adapter (not included) for fast charging. Original or Seneo fast charging Micro USB Cord and Original adapter are supported. Those 3rd party cables and adapters may charge at slow speed. It’s normal for your phone to get warm or even warmer during the charging process, and the PHONE CASES is suggested to be REMOVED while charging. 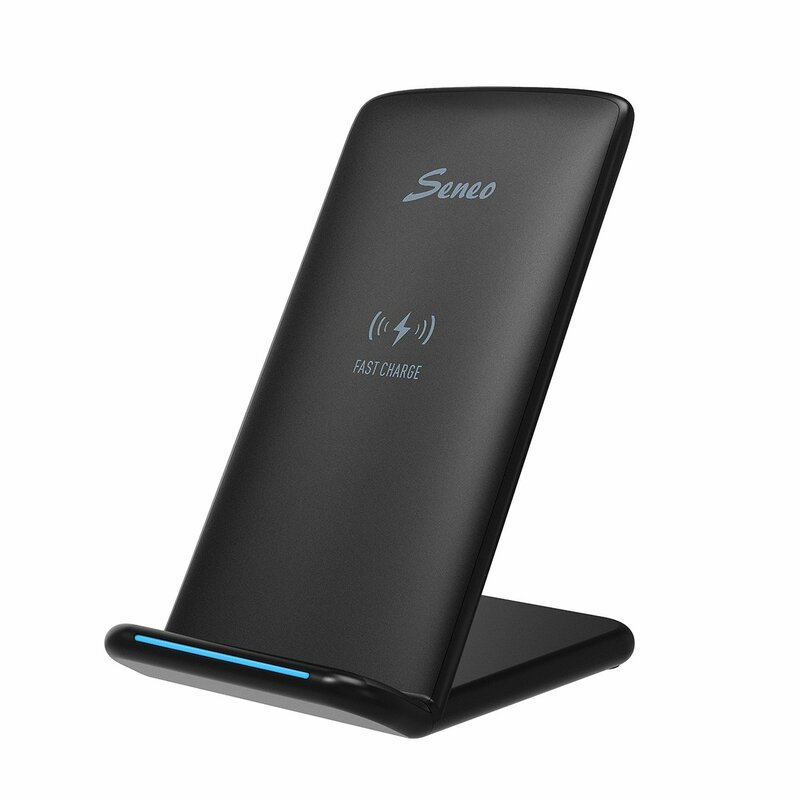 Retail Package includes: 1 x SENEO fast wireless charger stand, 1 x Micro USB Power Cable (NOT including the AC adapter), 1 x User Manual, 1 x 18-month warranty. Seneo wireless chargers help you forget about messy cables by traditional chargers. You can place qi wireless charger on your bedside cupboard, offices desk, tea table or other places. Fast charge modes are ONLY available for the Samsung Galaxy Note 8, S8, S8 Plus, S7, S7 Edge, S6 Edge Plus, Note 5 and will charge all the Qi-enabled devices at a regular speed. Fast wireless charger causes no beep or overheat. Once full charge, the charger turns off and a dim Blue-green light indicates fully charged. Tips: The phone will be charged again once the battery drop from 100% to 99%, making sure a full-charged phone in the morning for you to go. Designed-in curved bottom, provides good stability for some curved phones and decreases the chance of dropping. Built-in over-voltage, under voltage, and short-circuit protection provides ultimate safety for your smartphone. 1. For Galaxy S6 Edge Plus, Droid Turbo 2 and other 5.5 inches(or bigger)screen smartphones; Please put your phone horizontally for better charging effect. 2.When the light flashes by blue and green alternately, please check that if there is foreign body, like metal matter and then place it charge again. 3. It’s normal for your phone to get warm or even warmer during the charging process. But not cause any problems for the phone. No metal phone cases or cases thicker than 4 mm when charging.